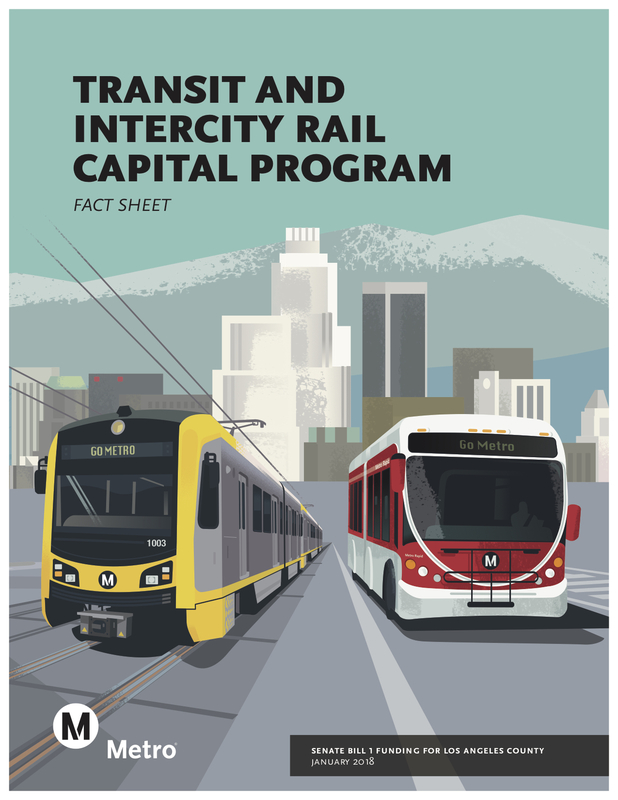 As part of Metro’s efforts to use local funds to attract other money to build projects, the agency is applying for $1.4 billion from the state’s Transit and Intercity Rail Capital Program (TIRCP). 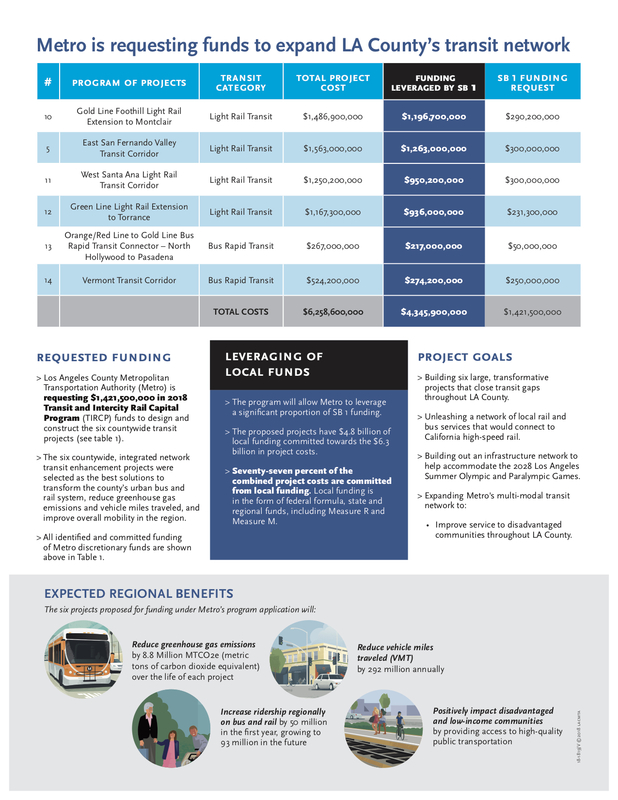 As the above flier shows, the funding would be used to help fund six major transit projects: the Gold Line extension to Montclair, the East San Fernando Valley Transit Corridor (bus rapid transit or light rail between Van Nuys and the Sylmar/San Fernando Metrolink Station), the West Santa Ana Branch Corridor (light rail between Artesia and downtown Los Angeles), the Green Line extension to Torrance, bus rapid transit between the Red/Orange Line in North Hollywood and the Gold Line in Pasadena and Vermont Avenue bus rapid transit. Key stat: The above projects already have $4.8 billion in local funding, mostly from the Measure R and M sales tax measures approved by L.A. County voters in 2008 and ’16, respectively. On a variety of fronts, Metro is hoping to leverage those funds into state and federal grants to help build these projects and others. Fun facts: The East San Fernando project was already awarded a $202 million grant from another state fund, the STIP, in March. As for why Metro deserves the money: Los Angeles County’s annual transit ridership is four times that of any other county in the state and Metro has the highest annual passenger miles of any other operator in the state. The TIRCP is the largest state discretionary funding program and is overseen by the California State Transportation Agency. Its purpose: modernize transportation infrastructure, reduce greenhouse gas emissions, improve transit safety and grow rail ridership. As with other state transportation programs, the TIRCP is reliant on funds from Senate Bill 1, the transportation bill approved by the Legislature last year and signed into law by Gov. Jerry Brown. SB 1 raised vehicle fees and the gas tax (which hadn’t been increased since 1994) and marks the state’s largest investment in transportation in more than 40 years. The TIRCP has provided $150 million in funding for other Metro projects in the past, including $38.5 million for the rebuilding of Willowbrook/Rosa Parks Station and Blue Line operational improvements, $69.2 million for the Red/Purple Line portal widening and turnback project and $40 million for the Airport Metro Connector, the new station at Aviation Boulevard and 96th Street where bus riders and those on the Crenshaw/LAX Line and Green Line will transfer to the future LAX people mover. If the SB1 repeal efforts fail (fingers crossed) would Metro consider ditching BRT on Vermont and instead building rail? It seems like SB1 funds, along with Measure M dollars and other dollars already secured, would be enough leverage to get some federal dollars such that Vermont rail could be a good candidate for acceleration under the Measure M Acceleration Policy.